A steaming bowl of goodness. A Singapore hawker dish of Chinese origins, wonton mee takes two of our favourite things – noodles and dumplings – and combines them into one steaming bowl of goodness. Add a generous serving of roasted pork and you’ve got a delicious meal that will set you back only S$3-4. Singapore-style wonton mee with chilli sauce. Noodles with wontons is a dish you can sample in any region of China, but there are a few things that make the Singaporean hawker centre version unique, starting with the name. “Mee” is the word for noodles in Hokkien, a dialect now uncommon in mainland China but still spoken widely among ethnic Chinese communities across Southeast Asia, so asking for wonton mee in Beijing will not get you anywhere. The mee in a bowl of wonton mee should be flat yellow egg noodles cooked al dente so they have a springy texture. While many stalls will use store-bought noodles, the best wonton mee stalls make their own noodles fresh every day. The wontons (also spelled wantons) are stuffed with a mixture of prawns, minced pork and mushrooms. Traditionally wontons are cooked by boiling in soup broth, but in Singapore they are sometimes fried. 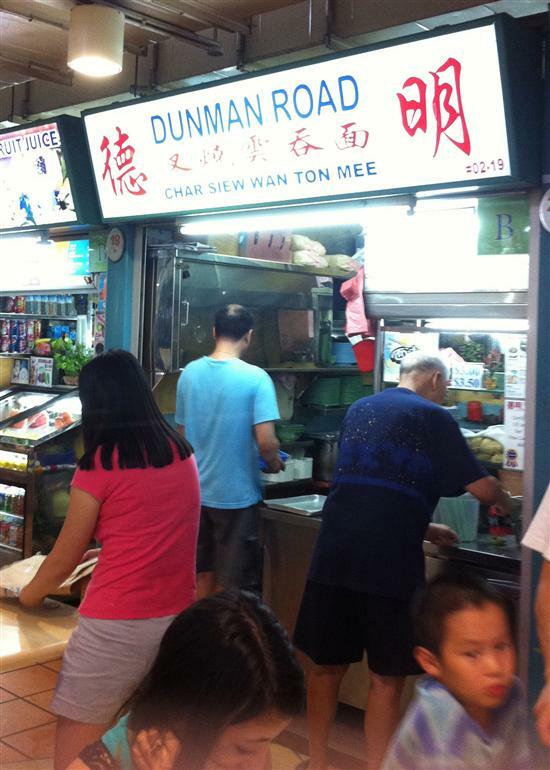 A good wonton mee stall attracts a steady customer flow. To turn this bowl of carbs into a balanced meal, wonton mee is topped with slices of char siew roast pork and a leafy green vegetable called kailan. Though it doesn’t have to be a spicy dish, to please the palates of spice-loving Singaporeans the local version of wonton mee is served with pickled green chillies and chilli sauce on the side. 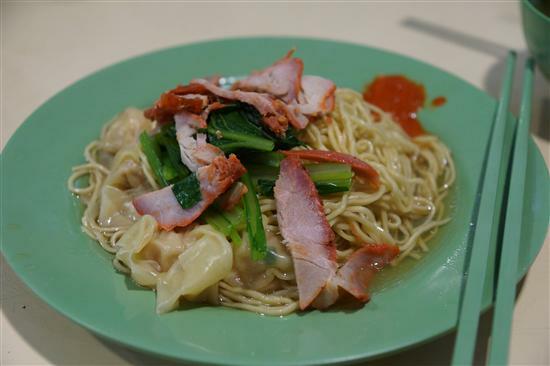 When ordering wonton mee at a hawker centre you may notice there are two options – wet or dry. The wet version is served as a soup with all the components in one big bowl with soup broth. In the dry version, the noodles and char siew are served on a plate and the soup broth and wontons are in a separate bowl.